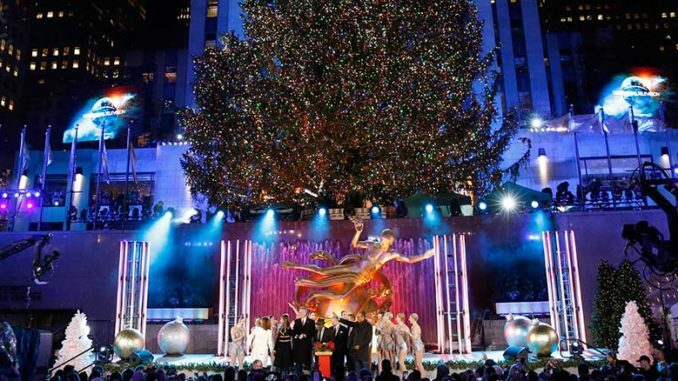 NBC kicks off the holidays with the lighting of the iconic tree in the heart of New York City with the 86th annual Christmas in Rockefeller Center. The evening with include festive musical performances and will be hosted by NBC’s Today anchors. An NHL Wednesday Night Hockey twin bill has the St. Louis Blues at the Detroit Red Wings, followed by the Pittsburgh Penguins at the Colorado Avalanche. The final day of the ACC/Big Ten Challenge has Virginia at Maryland (ESPN or ESPN2), Syracuse at Ohio State (ESPN or ESPN2), Rutgers at Miami (ESPNU), North Carolina at Michigan (ESPN), Purdue at Florida State (ESPN2) and Georgia Tech at Northwestern (ESPNU). Barry (Troy Gentile) realizes that as a future doctor, he should be more concerned about Murray’s (Jeff Garlin) health, so he enlists others to help get his father in shape. Beverly (Wendi McLendon-Covey) is horrified to learn that Erica (Hayley Orrantia) and Adam (Sean Giambrone) don’t want any of the priceless heirlooms in her fancy, never-really-used living room. After confronting the parents who were part of “The Midnight Club” 25 years ago, Betty (Lili Reinhart) follows some strong leads in hopes of finding out who the true Gargoyle King is. Veronica’s (Camila Mendes) attempt to prove Archie’s (KJ Apa) innocence lands her in hot water. Finally, Archie turns to Kevin (Casey Cott) for help making things right. The cost of running Lyon Family Management starts to put pressure on Cookie (Taraji P. Henson) and Lucious’ (Terrence Howard) relationship. When Kingsley (A.Z. Kelsey) pulls a power move of his own that has major financial repercussions for Lucious, Cookie thinks back to their early struggles. The second half of Season 5 continues with Ivar the Boneless (Alex Høgh Andersen) as ruler of Kattegat. He has sworn revenge on those who have betrayed him, including Lagertha (Katheryn Winnick), who has fled with Bjorn (Alexander Ludwig) and Bishop Heahmund (Jonathan Rhys Meyers) at her side. Kattegat must also contend with the arrival of the notorious Duke Rollo (Clive Standen), whose motives are still unclear. Travel to the Arctic to follow the life-changing journey of two newborn polar bear cubs as they leave their den for the first time. Bravely led by their mother, the cubs must make the perilous voyage to the sea to feed. Actress Kate Winslet narrates. Haley (Sarah Hyland) needs a little motherly advice from Claire (Julie Bowen) as she considers her future. Meanwhile, Jay (Ed O’Neill) and Cam’s (Eric Stonestreet) less than politically correct coaching style earns them a class on sensitivity from Manny (Rico Rodriguez) and Phil (Ty Burrell). The episode guest-stars Mira Sorvino, Rob Riggle and Andrew Daly. The return of Layla’s (Greta Onieogou) music mogul father gives Spencer (Daniel Ezra) the perfect opportunity to give back to Crenshaw and reunite with an increasingly distant Coop (Bre-Z). But Coop’s deepening affiliation with Shawn’s (Jay Reeves) gang threatens Spencer’s good intentions. Will (Taran Killam) encourages Angie (Leighton Meester) to rediscover her passion for heavy metal music by taking a guitar class, and in turn, Angie insists that Will get back in the field covering weather by driving both of them into a storm. Meanwhile, Douglas (Brad Garrett) pursues his crush on Big Red (guest star Rebecca Creskoff) with the help of Miggy (Jake Choi). John Legend and Chrissy Teigen celebrate the season alongside the couple’s family and talented celebrity friends. Legend performs a selection of songs from his 2018 holiday album, A Legendary Christmas. The special will re-air on Wednesday, Dec. 12. Shania Twain, Jake Owen and Travis Tritt welcome special guest Trace Adkins. It’s the first holiday season since the gates reopened and Anna (voice of Kristen Bell) and Elsa (voice of Idina Menzel) host a celebration for all of Arendelle. When the townspeople unexpectedly leave early, the sisters realize they have no family traditions of their own. In this animated special, Simon Masrani has an idea for a new attraction that is guaranteed to keep Jurassic World at the forefront of theme-park entertainment. Kevin Durant and the Golden State Warriors head to Toronto for a showdown with Kawhi Leonard and the Raptors. Following that game, Tobias Harris and the L.A. Clippers are in Sacramento for a collision with Zach Randolph and the Kings. Drew Brees and the New Orleans Saints head to AT&T Stadium in Arlington, Texas, for a Week 13 showdown with Dak Prescott and the Dallas Cowboys on Thursday Night Football. During a post-Christmas play date, the Toy Story gang find themselves in uncharted territory when the coolest set of action figures ever turn out to be dangerously delusional. Join Jordan Fisher (Dancing With the Stars: Juniors) and Sarah Hyland (Modern Family) as they host the magical two-hour event from the Walt Disney World Resort and Disneyland Resort. This star-studded primetime celebration showcases incredible musical performances from Gwen Stefani, Meghan Trainor, Brett Eldridge and more. Will (Eric McCormack) convinces Grace (Debra Messing) that her boyfriend, Noah (guest star David Schwimmer), isn’t in the wrong by refusing to let her meet his daughter, Katie. When Grace goes to apologize to Noah, she unintentionally meets Katie. Meanwhile, Will’s mom, Marilyn (guest star Blythe Danner), visits after the death of her beloved dog, and becomes upset when she doesn’t get the emotional support she expects from her son. Meanwhile, Jack (Sean Hayes) gets into an argument with his rec center boss, Theo (guest star Derek Gaines). Tensions rise among the students after Alaric (Matthew Davis) decides to give the students a bigger voice by forming an honor council. Determined to find out more about Landon’s (Aria Shahghasemi) past, Hope (Danielle Rose Russell) does a series of magical tests on him. When Maya (Madhur Jaffrey) is temporarily unable to care for the kids due to an injury, Emet (Sarayu Blue) and David (Paul Adelstein) reluctantly hire a babysitter, only to discover their lives may be better for it. Loosely inspired by a true story, this Italian series is a coming-of-age story that explores the unseen lives of Roman high schoolers. In the drama, a group of teens defy society in their search for identity and independence against the backdrop of forbidden love, family pressures and shared secrets. Must-see sequel! Journalist Amber (Rose McIver) and Aldovia’s Prince Richard (Ben Lamb) plan their holiday nuptials. Netflix’s first Polish original series is a conspiracy thriller helmed by four prominent directors from that country. It tells the story of a dystopian world where the Iron Curtain never fell, and Poland is the center of the universe shaping the future of the entire world. ESPN2 airs the MAC football conference championship game between the winners of the East and West Divisions at Ford Field in Detroit. The Pac-12’s North and South Division champions clash tonight for the conference championship at Levi’s Stadium in Santa Clara, Calif.
Harried bakery owner Kate Holiday (Melissa Joan Hart) has lost her holiday spirit. But after Kate hangs the last ornament on her tree and goes to bed, she wakes to finds a handsome soldier named Chip (Barry Watson) — who may or may not be the Nutcracker Prince from Tchaikovsky’s The Nutcracker — in her living room. Also stars Marissa Jaret Winokur, Conchata Ferrell and Rizwan Manji. Rebecca (Rachel Bloom) takes a trip to visit her mother (guest star Tovah Feldshuh). Josh (Vincent Rodriguez III) housesits for Rebecca and discovers being alone is harder than it seems, while Nathaniel (Scott Michael Foster) helps one of Paula’s (Donna Lynne Champlin) clients in an effort to do something good. Lem (Peter Mensah) makes a shocking decision; Olivia’s (Arielle Kebbel) past comes back to haunt her; Fiji (Parisa Fitz-Henley) seeks outside help from her fellow Light Witches; a suicide pits Manfred (François Arnaud) and Kai (Nestor Carbonell) against one another. Doc (Russell Hodgkinson) must “spirit walk” again to help save the chief of the Water Keepers and get the water flowing to Newmerica. Each Friday, host Gerry Baker welcomes influencers from across the business, finance, politics and tech space to lead discussions on the top news headlines of the week. Additionally, Baker will also expand upon the larger trends impacting business in America. Kicking off the weekly primetime series, Baker sits down with former Treasury Secretary Lawrence Summers for an in-depth interview to discuss international trade, overseas manufacturing, the state of the United States economy and more. Doc (Rukiya Bernard) and Jolene (Caroline Cave) clash with Denver authorities over the repellent; Flesh (Vincent Gale) chooses to face his past; Axel (Jonathan Scarfe) struggles with leaving Scarlett (Missy Peregrym) behind; Ivory (Jennifer Cheon) and the Sisterhood infiltrate Denver. It’s college football conference championship Saturday, featuring title games for the Big 12 (ABC), Sun Belt (ESPN), American (ABC), Mountain West (ESPN), Big Ten (FOX) and ACC (ABC). But the best of the bunch is a rematch of last season’s national championship game as Alabama and Georgia clash for the SEC title in Atlanta (CBS). Saturday college basketball on FOX features Louisville at Seton Hall, Gonzaga at Creighton and Nevada at USC. ESPN2 has UNC-Greensboro at Kentucky, Villanova at La Salle, Vanderbilt vs. NC State, Stetson at Duke and Oregon at Houston. Purdue at Michigan and Stanford at Kansas round out the schedule on ESPN. This half-hour special, hosted by Jordan Fisher and Disney stars Ruby Rose Turner and Dakota Lotus, features musical performances by Gwen Stefani, Brett Eldredge, Asher Angel and Meg Donnelly and special appearances by Disney Channel stars. Plus, the special takes viewers behind the scenes of Lightning McQueen’s Racing Academy, a new experience based on the world of Cars, which rolls into Disney’s Hollywood Studios in spring 2019. The designer of a successful networking/dating app that pairs busy singles with “strictly platonic” partners for all of the holiday season’s social engagements is matched with a man with whom she’s already had several disastrous encounters. Stars Jen Lilley, Brant Daugherty and Lindsay Wagner. In the frenzy before Christmas, two single parents — busy working mom Abby (Vanessa Lachey) and overwhelmed lawyer Ryan (Brendon Zub) — accidentally mix up their toys at a crowded department store. Although the two parents can’t stand each other, they are forced to work together to salvage the holidays for their children. British actress Claire Foy, who won an Emmy for Netflix’s drama The Crown and has starred in two acclaimed recent feature films, First Man and The Girl in the Spider’s Web, makes her SNL hosting debut tonight. She is joined by musical guest Anderson .Paak. The final College Football Playoff rankings of the season are revealed today on ESPN, and we’ll know which four teams will be competing in the CFP semifinal games taking place Dec. 29. Alabama, Clemson and Notre Dame are likely in the mix, with Georgia, Ohio State, Oklahoma, Washington State, Kentucky, and LSU still hoping for a spot in the top four. Tonight, MeTV features a handful of fun holiday episodes, including The Jeffersons’ “984 W. 124th Street, Apt. 5C,” which aired in 1977. Immediately following is the series’ 1978 episode “George Finds a Father.” Then it’s on to the 1988 Brady Bunch reunion film A Very Brady Christmas. Detective Mackenzie Bennett (Emily Alatolo) is on the trail of a diamond thief, but when she discovers that her cute new crush is the prime suspect, she goes undercover to catch him in the act. As she conducts her investigation, she finds herself getting close to a man who might be a criminal — but might be the man of her dreams. Also stars Franco Lo Presti, Andrew Bushnell, Yanic Truesdale and Lauren Holly. FOX News Channel’s Scandalous returns for a new four-episode season called Scandalous: Chappaquiddick, which will spotlight the personal tragedy and political drama that enveloped the United States in the summer of 1969, turning the island of Chappaquiddick into a household name. The program will chronicle the perspective of many of those involved, along with the journalists who covered the puzzling accident that left the political career of the late Senator Edward “Ted” Kennedy tarnished and led to the death of campaign strategist Mary Jo Kopechne. Through archival footage, records and never-before seen photos, the series will revisit the daily twists and turns of the drama that first captivated the world nearly 50 years ago. In addition to airing on FNC, special director’s cuts of the series will be available on FOX Nation. The last four teams remaining in the running for the Mirrorball Trophy perform tonight for the chance to make into the holiday-themed finale. Country legend Garth Brooks takes the stage for the first concert ever at the University of Notre Dame’s 88-year-old football stadium. Filmed in October, the special includes Brooks’ greatest hits as well as some unexpected covers, all in front of an enthusiastic sold-out crowd of over 84,000. When Lisa and Homer start spending quality time together, their bond gets stronger, and Bart feels neglected. Architect Nell Harper (Jerrika Hinton) returns to her hometown for an unpopular project that will turn the town’s historic Majestic Playhouse into a multiplex. When she meets Connor (Christian Vincent), the theater’s new owner, she tries to change his mind about modernizing the theater by showing him the joys of the town’s Twelve Day Festival. When next-door neighbors Sadie (Kyla Pratt) and Ben (Jarod Joseph) were 8 years old, they planted a scrawny 3-foot-tall Christmas tree behind their church and made a Christmas pact. But now, life has gotten in the way, and the pact is threatened. Ben and Sadie need some Christmas magic to recommit to each other and their long-ago promise. Also stars former A Different World stars Kadeem Hardison and Jasmine Guy. Get in the spirit of the season with a marathon of holiday episodes from Everybody Loves Raymond, Two and a Half Men, The King of Queens, The Goldbergs, The Golden Girls and Roseanne. In part two of the reunion, Kelly and Vicki continue to hash out their issues. Shannon’s emotional year is discussed as the women chime in about her divorce. Emily opens up about the body shaming she received online. Emotions run high when Tamra and Shannon tackle their fractured friendship. While on the hunt for Jada (guest star Aleyse Shannon), Mel (Melonie Diaz) scours the Book of Shadows as Harry (Rupert Evans) and Charity (guest star Virginia Williams) try to find any clues that might lead them to this new demon. As if that isn’t enough, they discover that there is a changeling demon on the loose that puts one of the sisters in danger. Oscar-nominated actor James Cromwell joins the spy drama for its third season in a recurring guest role as Gilbert Dorn, a former CIA legend put out to pasture who appears on a podcast revealing information about past missions. Season 3 takes place over the course of 11 days in Eastern and Central Europe as Chief of Station Valerie Edwards (Michelle Forbes) guides her team through the high-stakes relationship between Russia, the United States and its vulnerable NATO allies. Richard Armitage, Richard Jenkins, Rhys Ifans and Ashley Judd also return. Eighteen years after the original film introduced the world to Eve, Tyra Banks reprises her role as the doll who comes to life to help a young woman find her confidence. When Grace Manning (grown-ish star Francia Raisa) realizes that she’s in over her head as the 20-something CEO of Marathon Toys — the huge toy company started by her mother — Grace’s childhood Eve doll magically comes to life and helps her get her life back on track. The legendary Victoria’s Secret Angels take to the runway, showcasing an all-star lineup of musical guests including Bebe Rexha, the Chainsmokers, Halsey, Kelsea Ballerini, Rita Ora, Shawn Mendes and the Struts. Sister networks REELZ Channel and Ovation simulcast a taped broadcast of the lighting of the National Christmas Tree on the Ellipse in President’s Park near the White House. This American tradition will again feature live musical performances along with, of course, the official lighting of the park’s Colorado blue spruce for the holiday season. George R.R. Martin’s (Game of Thrones) Hugo Award-nominated 1980 novella is adapted into this 10-episode event series starring Eoin Macken, David Ajala, Gretchen Mol and Jodie Turner-Smith. Set in the year 2093, the story follows a team of scientists aboard an advanced spaceship seeking out other life forms. Their mission takes them to the edge of sanity as they realize true horror is already on their ship. Nightflyers airs all of its episodes over the course of Sunday through Thursday, and next Sunday through Thursday as well. Join Amy Grant, Vince Gill, and Kellie Pickler as they shine a light on the true spirit of Christmas with heartfelt stories, favorite family holiday memories, and unforgettable musical performances. It’s Christmas and the Peetes are planning their annual holiday party! Holly gets overwhelmed with the preparations, Rodney decides to go all out with his holiday decorations, and Ryan writes her very first Christmas song. Tonight kicks off with the first-ever “Heavyweights” episode, featuring displays that have grown too large for any home, with fire-breathing dragons and a mill covered in a record-breaking 4 million lights. In the second episode of the evening, four festive families showcase their displays, including a massive Christmas block party, an electrical parade and a decorated 60-foot live Douglas Fir. Felicity (Emily Bett Rickards) stands by her recent decisions regarding her family. Meanwhile, Diggle (David Ramsey) and Lyla (Audrey Marie Anderson) continue to look into the Dante painting that Curtis (Echo Kellum) found. Tonight, the top 10 artists perform live in front of the coaches for America’s vote, and Blake Shelton performs. NFC East rivals clash at Philadelphia’s Lincoln Financial Field as the Washington Redskins face the Eagles on Monday Night Football. The new season kicks off with the anticipated opening of TomTom. Lisa channels her energy into making sure her newest venture is the epitome of perfection, but when last-minute problems arise, she must assign more responsibility to her junior partners Tom Schwartz and Tom Sandoval — whether they’re ready or not. Marta (Anamaria Marinca) convalesces as a mysterious illness sweeps through Olympus Town and Lukrum Colony. When IMSF realizes one of its own has died as a result, it races to determine the cause, origin and mode of transmission before time runs out — and more lives are claimed. Back in the present day, Vladimir Chuprov, a Greenpeace activist, sheds light on an indigenous health crisis being kept quiet by the Russian state to benefit their Arctic oil endeavors. While the walls at the Carlyle don’t talk, they definitely whisper. This documentary from Matthew Miele brings to life the untold stories of this legendary hotel as heard from the mouths of its own employees, as well as its top clientele, including George Clooney, Anjelica Huston, Tommy Lee Jones, Vera Wang, Anthony Bourdain, Roger Federer, Wes Anderson, Sofia Coppola, Jon Hamm, Lenny Kravitz, Naomi Campbell and Elaine Stritch. Hosts Stephen “tWitch” Boss and Allison Holker are joined by celebrity “elves” including ballerina Misty Copeland, former NFL athlete DeMarco Murray, The Fosters’ Sherri Saum and, of course, Freeform Santa to spread holiday cheer to deserving people. The 90-minute special is filled with heartwarming moments including a home giveaway, a surprise baby shower at a military base, an epic family reunion and a celebration for two very special children at Children’s Hospital Los Angeles. Dr. Murphy (Freddie Highmore) and Dr. Park (Will Yun Lee) treat two patients who collapse at the local airport and whose symptoms point to an infection that may become airborne. The staff races to contain the infection before it spreads to the rest of the patients in the ER, resulting in a hospital quarantine during the holidays. A crew of best friends attends one of the most coveted and exclusive “floating festivals,” called “The BucketLust,” where 350 people and 35 catamarans set sail to breathtaking locales throughout the Bahamas. Every day brings a new stunning view and a thrilling excursion as they take dips with stingrays and swimming pigs, ride rocket-power jet boards and spend their nights partying until dawn. In 2015, Sandra Bland, a 28-year-old black woman from Chicago, was arrested for a traffic violation in a small Texas town. Three days later, she was found hanging from a noose in her jail cell. Her death was ruled a suicide, but it sparked allegations of a racially motivated police murder and made Bland’s case a rallying point for activists nationwide. This documentary features Bland’s passionate video blogs, takes a look at her compelling life and death, and follows her family and their legal team as they try to make sense of what happened. Actress Mandy Moore is shocked to discover ancestors who lived in Australia, and is determined to unlock the mystery of how they got there. Moore is touched by the courage of those who made the journey and the sacrifice of those who were left behind. Comedian Jon Dore noticed that the world is full of big problems. In this special, Dore researches the issues of cyberbullying and inappropriate teacher-student relationships and then presents his ideas for fixing them. John Tavares and the Toronto Maple Leafs head to Buffalo to face off against Jeff Skinner and the Sabres on NBCSN. In this special 100th episode of the show, Barry (Grant Gustin) and Team Flash come up with a plan to stop Cicada (Chris Klein), which calls for Barry and Nora (Jessica Parker Kennedy) to travel back in time to gather some key necessities. However, Barry hesitates, concerned about his daughter seeing certain parts of his life. Seven of the artists who performed last night will be revealed as safe by America’s votes. The bottom three artists will then compete for the Instant Save, and two will be eliminated. Actress Megan Fox hosts this series in which she investigates myths and stories left behind by our ancient ancestors. Meeting with experts and archaeologists while perusing priceless texts and fascinating artifacts, Fox attempts to uncover answers about the age-old mysteries that still perplex scientists and archaeologists to this day. In the series premiere, Fox journeys to Scandinavia and England to investigate a bold new hypothesis that powerful female warriors played a role in helping the Viking hordes become the most feared army of the time. Bow (Tracee Ellis Ross) makes a new friend at work and Dre (Anthony Anderson) thinks she has broken bird syndrome. Meanwhile, Junior (Marcus Scribner) transforms his shared room with Jack (Miles Brown) into a frat house and Ruby (Jenifer Lewis) and Diane (Marsai Martin) gang up against them. In the new episode “Compromised,” a key witness and a U.S. marshal are ambushed and killed, and Maggie (Missy Peregrym) and OA (Zeeko Zaki) must track down a man who leaked the information that led to their murders. Nobody makes us laugh at Christmastime quite like SNL — catch some of your favorite holiday skits tonight. Sgt. Grey (Richard T. Jones) informs Officers Nolan (Nathan Fillion) and Bishop (Afton Williamson) that they are going to have a movie director as a ride-along during their patrol after a fun afternoon granting the wish of a Make-A-Wish kid as honorary police officer. Meanwhile, Officer Bradford (Eric Winter) is tested once again after he learns that his wife has been arrested for drug possession. In the new episode “Risk Assessment,” the NCIS team investigates the murder of a Navy contractor who secretly lived two separate lives for decades. Entrepreneur Marcus Lemonis is back for Season 6 of the series that finds him putting his own money on the line to help small-business owners save and grow their companies. Among the 12 new episodes this season will be a “sequel” of sorts to one of the show’s most explosive episodes — “The Casery,” from Season 5. Shania Twain, Jake Owen and Travis Tritt welcome special guest Hunter Hayes. Logan is on vacation at the Bare Feet Retreat, but his phone is broken. In India, customer service representative Vali helps Logan although he’s in the midst of a crisis of his own. Guest stars include Adhir Kalyan, Jon Bass, and Meera Rohit Kumbhani. Barry (Troy Gentile) thinks he wants a wild, adult bachelor party, but he ultimately realizes Adam’s (Sean Giambrone) idea of a party to celebrate his brother is more his speed. Meanwhile, Murray (Jeff Garlin) never spends money on himself, so Beverly (Wendi McLendon-Covey) surprises him with an expensive sports car. Dan Fogler (the Fantastic Beasts movies) returns as Uncle Marvin. The hit game show that ran on NBC from 2005-09 is back as Howie Mandel returns to host 30 new episodes on CNBC. The new Deal or No Deal will continue to offer up a high-pressure, high-stakes game of risk and reward, in which contestants face a series of potentially life-altering decisions. With 26 sealed briefcases full of varying amounts of cash — ranging from a penny to $1 million — contestants have to decide whether to accept an offer of cash from the mysterious entity known only as the Banker, in exchange for what might be contained in the contestant’s chosen briefcase. Fearful that he will be caught, Archie (KJ Apa) hits the road and ends up at a farm outside Riverdale, where he meets Laurie Lake (guest star Riley Keough). Meanwhile, after Alice (Mädchen Amick) takes extreme measures to ensure Betty’s (Lili Reinhart) safety from the Gargoyle King, Betty finds herself up against a formidable foe from her past. The financial security of the Lyon family is on the line as their LFM showcase approaches. Natalie (Torrey DeVitto) and Will (Nick Gehlfuss) prepare for their big day, but an unsuspecting Will soon finds himself sidetracked. Dr. Charles (Oliver Platt) and Goodwin (S. Epatha Merkerson) disagree on how to best handle a patient’s treatment, and Dr. Choi (Brian Tee) and April (Yaya DaCosta) are on their own when a pregnant woman delivers. This new three-part series explores the Mississippi River as it twists and turns through America’s midsection, and how wildlife and humans take advantage of the great waterway. The premiere episode, “The Headwaters,” looks at the source of the river in Minnesota’s Lake Itasca. Dede’s husband, Jerry (guest star Ed Begley Jr.), comes to town to bequeath her possessions to the family. Mitch (Jesse Tyler Ferguson) and Claire (Julie Bowen) receive a little more of Dede than they really know what to do with, and Jay (Ed O’Neill) and Gloria (Sofia Vergara) invite Jerry to stay with them while he is in town. At an explosive homecoming dance, friendships in both Crenshaw and Beverly Hills will be put to the test when decisions made by Spencer (Daniel Ezra) trigger an avalanche that drastically changes the course of several lives. Meanwhile, Billy (Taye Diggs) finds himself forced to spend some quality time with Grace (Karimah Westbrook). This six-part multiplatform series documents the work of law enforcement on the U.S.-Mexico border, as well as the real lives and stories of those who live and work along its remote stretches. Each week, Discovery will broadcast live from its New York-based studio as host Bill Weir touches base with journalist Lilia Luciano, who will be in the field tracking action unfolding along the border. Experts will also weigh in on a range of border issues, offering insight and perspective on events as they occur. Carlotta (Queen Latifah) tries to make the Rhythm and Bells Festival a success, but challenges arise. Star (Jude Demorest) ends up in a legal bind, Alex (Ryan Destiny) makes a major career move, Simone (Brittany O’Grady) hides a secret and Cassie (Brandy Norwood) gets out of jail and seeks revenge. Then, tempers flare as Carlotta and Cassie’s father (guest star Ben Vereen), shows up unexpectedly. The stakes are high when a huge freeway pileup impacts someone dear to the firehouse family. Brett (Kara Killmer) and Foster (Annie Ilonzeh) encounter a harrowing call. Kidd (Miranda Rae Mayo) and Severide’s (Taylor Kinney) relationship is tested. Will (Taran Killam) is thrilled to throw the first-grade parent social so that he can use this event to springboard his anti-smartphone platform to get parents to wait to buy their kids cellphones until eighth grade. He ropes his new love interest, Dr. Dewan (Hannah Simone), into helping him, but his plan doesn’t work out quite like he had hoped. Gary (James Roday) has trouble dealing with Maggie’s (Allison Miller) life-changing decision, which takes him back to when Jon (Ron Livingston) was there for him during his chemo treatments. Rome (Romany Malco) finally opens up to his dad about his internal struggles, and Katherine (Grace Park) battles balancing being a working mother without Eddie (David Giuntoli). Series star Aisha Tyler directed the new episode “Broken Wing,” in which the BAU investigates the mysterious overdose deaths of patients who just completed rehab. When Antonio (Jon Seda) tries to save someone close to him, he crosses a line and puts the entire team at risk. Singer-songwriter Kane Brown is tonight’s special guest. College football’s most outstanding player of the year is awarded the Heisman Trophy in this ceremony in New York City.